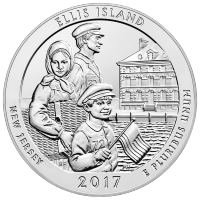 Purchase your 5 oz 2017 Ellis Island National Monument Silver Coin from our store at the lowest price online. 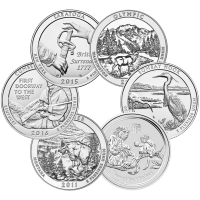 These .999 fine Silver coins form part of the ever popular ‘America The Beautiful’ series and are the fourth unique release of 2017. What better way to capture your own piece of the American Dream than with this unique commemoration of the Island that saved 12 million lives. 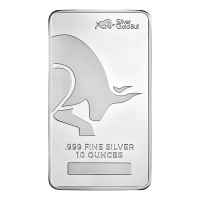 The 5 oz 2017 America the Beautiful | Ellis Island National Monument Silver Coin is highly sought after by collectors and is a truly meaningful way to diversify your Silver holdings. 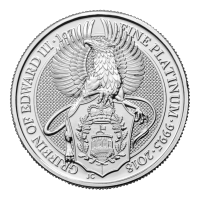 Reverse " 2017 E Pluribus Unum"
" 2017 E Pluribus Unum"
5 oz 2017 America the Beautiful | Ellis Island National Monument Silver Coin Purchase your 5 oz 2017 Ellis Island National Monument Silver Coin from our store at the lowest price online. 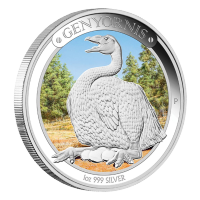 These .999 fine Silver coins form part of the ever popular ‘America The Beautiful’ series and are the fourth unique release of 2017. 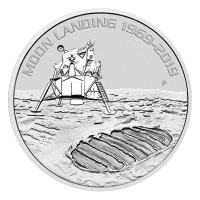 The reverse of the coin features a poignant image of a hopeful immigrant family making landfall at the safe haven of Ellis Island, New Jersey. Visible in the reverse field is the landmark Ellis Island Hospital Building and the rim features the date, the Ellis Island title and the motto, ‘E Pluribus Unum’ (Out Of Many, One.) Ellis Island was the first port of call for refuge seekers between 1892 and 1954 and will always be a powerful symbol of the Great American Dream. The coin’s obverse features the profile of President George Washington, the USA legend, the denominational value and the words: ‘Liberty-In God We Trust.’ What better way to capture your own piece of the American Dream than with this unique commemoration of the Island that saved 12 million lives. The 5 oz 2017 America the Beautiful | Ellis Island National Monument Silver Coin is highly sought after by collectors and is a truly meaningful way to diversify your Silver holdings.